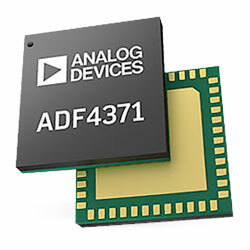 Analog Devices ADF4371 Microwave Wideband Synthesizer combines PLL with an integrated VCO to offer a wide continuous RF output range of 62MHz to 32GHz. The device is designed to support RF/microwave applications that must satisfy the most demanding next-generation needs across multiple markets, including aerospace and defence, communications infrastructure, test/measurement, and high-speed converter clocking. The integrated VCO of the device provides a fundamental output frequency ranging from 4000MHz to 8000MHz. Also, the VCO frequency is connected to divide by 1, 2, 4, 8, 16, 32, or 64 circuits that enable the user to generate RF output frequencies as low as 62.5MHz at RF8x. A frequency multiplier at RF16x generates from 8GHz to 16GHz. A frequency quadrupler generates frequencies from 16GHz to 32GHz at RF32x. RFAUX8x duplicates the frequency range of RF8x or allows direct access to the VCO output. To suppress the undesired products of frequency multiplication, a harmonic filter exists between the multipliers and the output stages of RF16x and RF32x. Control of all on-chip registers is through a three-wire interface. The device works with analog and digital power supplies ranging from 3.15V to 3.45V, and 5V for the VCO power supply. The device also comprises hardware and software power-down modes. The device is provided in a compact 7mm x 7mm 48-terminal LGA package, and is RoHS compliant.